Reconnecting Your Senses 2017 is a half-day programme that aims to bring together people from all walks of life to share and gain a new perspective on improving their quality of life by reconnecting their five senses. As sensory impairments in particular, hearing, could cause barriers in their social life, with the main impact being losing the ability to communicate with others. Which could then bring about social isolation and and be be a significant driver of diseases and mortality in older adults. People with heart disease, diabetes, chronic kidney disease, and/or Alzheimer's disease may have an increased risk of hearing loss. 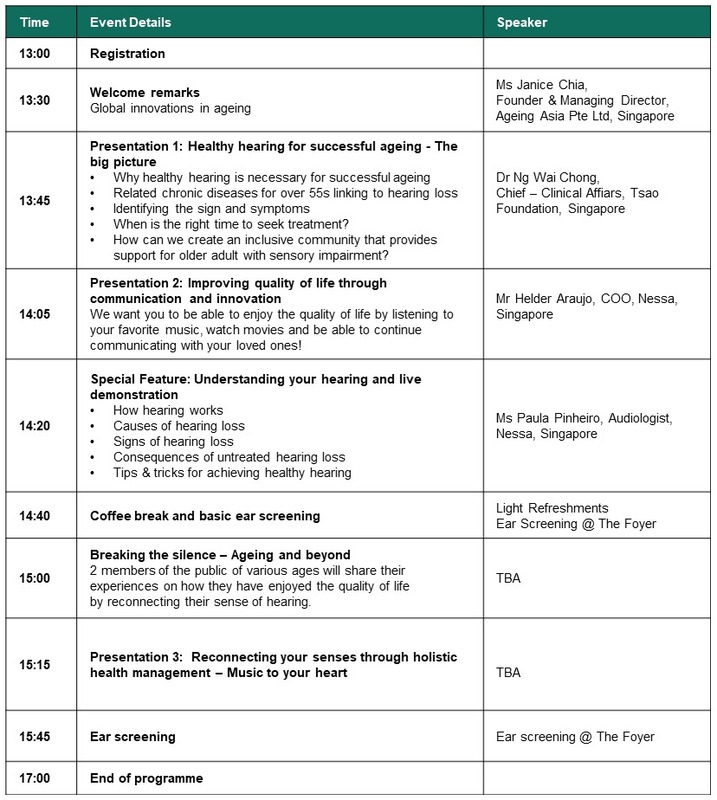 The programme includes otoscopy/ear check for participants and educational talks to understand how hearing works. You will also hear from healthcare specialist on chronic disease in older adults that will lead to hearing impairment, managing the signs and symptoms, holistic health management and more. Speakers consist of Dr Ng Wai Chong, Chief of Clinical Affairs of Tsao Foundation, Singapore. Mr Helder Araujo, COO of Nessa, Singapore and Ms Paula Pinheiro, Audiologist of Nessa, Singapore.